※We will close at 6pm on the last day Oct 31st Thursday. I have known Karen for many years after meeting her in my hometown of Brighton on the South East coast of the UK. She is well known globally for her musical output as part of Blood Stereo,Ceylon Mange,Decaer Pinga etc. Since turning 30 she has been exploring in depth the visual side of her creative output. This October we will be showing a diverse selection of her work showcasing her collage and acrylic paintings. Included will be a stunning set of paintings which were executed alongside her daughter Elkka. 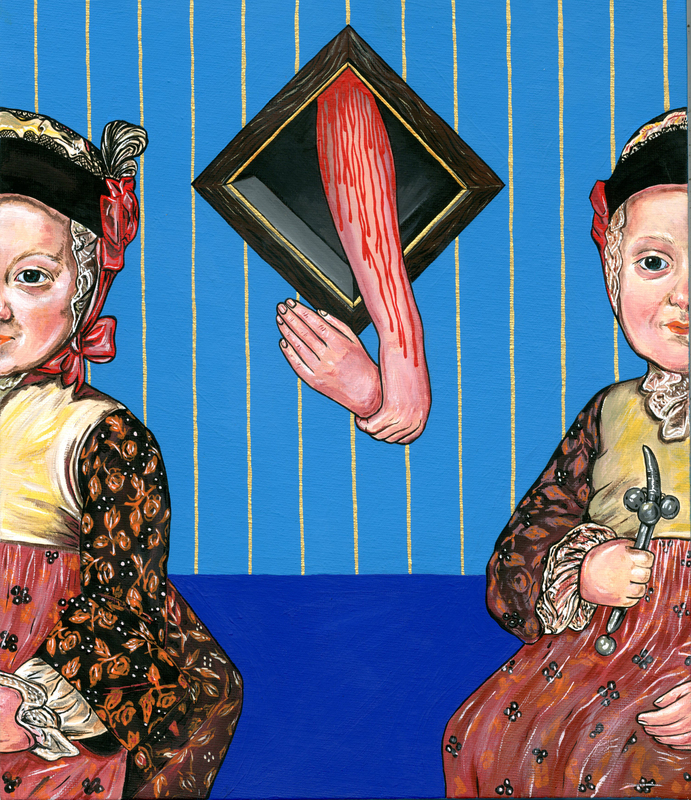 Come along and witness for yourself the complex world of this Scottish artist where the real and surreal come together in a feast of throbbing colour and bizarre yet enchanting subject matter. Karen Constance is a Scottish self-taught artist living on the South coast of England since 1996. She didnt start painting till the age of 30 and has since been very prolific, exhibiting in Germany, Denmark, Israel, USA, Scotland, and many other countries. Her art has featured on album/cd covers as well as in magazines and on gig posters, Karen also plays experimental music with her husband Dylan Nyoukis as ‘Blood Stereo’ and is co-curator of Brighton’s experimental sound and art festival ‘Colour out of Space’. She recently started collage and painting collaborations with her 8 year old daughter Elkka.